Is This Winning Hack the Smallest Screen Reader? #WearableWednesday « Adafruit Industries – Makers, hackers, artists, designers and engineers! EvoXLabs in Philly just held another amazing hackathon with the theme of “Technologies for the Future: Green, Sustainable and Accessible.” Although I was not able to attend this year I did catch a post about the winning team, who had things wrapped around their finger, according to Technical.lyPhilly. 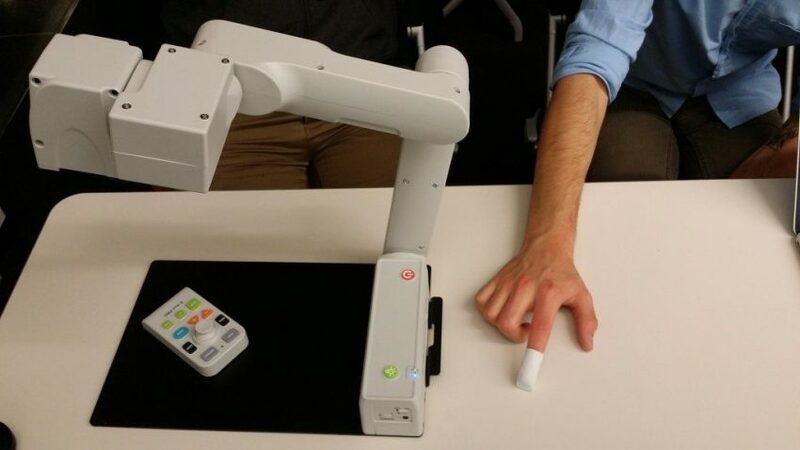 The joint team of students from St. Joseph’s University and Philadelphia University created Touch Reader, a finger wearable with the goal of being the ideal solution for those bulky readers often used by people with vision challenges. Notice in the pic the large traditional reader, E-bot Pro, next to the tiny prototype contender. Wouldn’t it be nice to carry your reader on a keychain? The project was inspired by Eli St. Amour, a local beekeeper with unusually good hearing. The team’s prototype is based on an infrared scanner paired with an iPad to allow words to be read aloud. This may not seem significant, but think of how many times you may stop to read as you handle your commute through the city. A mobile phone can do some of the work, but it can’t help you out when you pick up a paper or when someone hands you a document on the fly. The team was excited about the new reader for Eli. I’m sending out massive high-fives to everyone at evoXLabs, as well as the participating teams, for building more inspiring tech in the spirit of accessibility. This event, evoHaX, is proving to be one of Philly’s most interesting hackathons, and now with a few years under its belt I’m hopeful that start-ups will follow. There’s nothing like hacking for good. For those of you who are interested in DIYing your own wearable tech to help others, you should check out our Getting Started with FLORA guide. FLORA is a small microcontroller that lends itself to all sorts of wearables since it can be stitched or soldered. It’s modular and there’s a bundle of cool components available that will allow your project to include sensing, direction and even connectivity. What will you create?